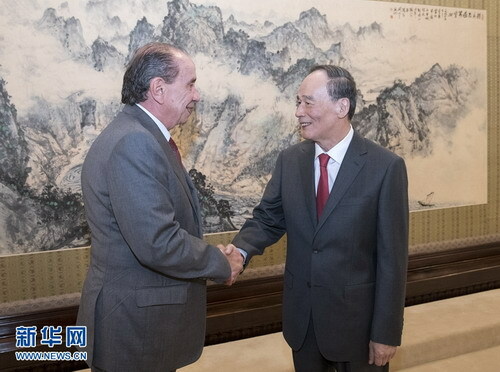 On May 14, 2018, Vice President Wang Qishan met at Zhongnanhai with Foreign Minister Aloysio Nunes of Brazil. Wang Qishan conveyed President Xi Jinping's warm greetings to President Michel Temer of Brazil. He expressed that the foundation of exchanges between two countries lies in people-to-people exchanges, while guidance of heads of state is the key. As comprehensive strategic partners and major developing countries, the two countries share extensive consensus on international issues. Both countries have distinctive economy and culture, enjoy profound people-to-people friendly feelings and make great achievements from cooperation in various fields. The constant development of China-Brazil relations endows bilateral cooperation with many new contents. Both sides should have a deep understanding of the position of China-Brazil relations set by the two heads of state, keep up with the times and give full play to the role of mechanisms including the China-Brazil High-level Coordination and Cooperation Committee, and continuously translate cooperation potential into the well-being of the two peoples, in a bid to make contributions to the building of a community with a shared future for mankind. Aloysio Nunes expressed that Brazil pays high attention to its relations with China. Strengthening Brazil-China cooperation is not only conducive to the two sides, but also has global significance. Brazil stands ready to make joint efforts with China to break new ground for bilateral relations.